I've been hearing this virus called Middle East Respiratory Syndrome Coronavirus or MERS CoV even last year when my husband came home from Qatar. I first heard of it from the doctor we see when my hubby goes for check up because his cough never go away. The doctor’s reaction when he knew where hubby came from is alarming but glad that it isn't the virus he feared of. I heard that there death toll is slowly increasing because of this virus and the patients only last in 10 days after it was confirmed to have MERS CoV. Currently this virus is reportedly hit the Middle East country and in some parts in Asia including ours. According to Wikipedia transmission of this virus from person to person is very low. The cells MERS-CoV infects in the lungs only account for 20% of respiratory epithelial cells, so a large number of virions are likely needed to be inhaled to cause infection. The World Health Organization is now warning that the MERS-CoV virus is a "threat to entire world." 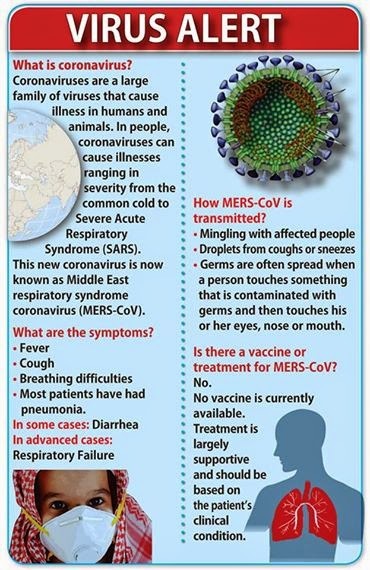 However, Dr. Anthony Fauci of the National Institutes of Health in Bethesda, Maryland, stated that as of now MERS-CoV "does not spread in a sustained person to person way at all." Dr. Fauci stated that there is potential danger in that it is possible for the virus to mutate into a strain that does transmit from person to person. And just like any virus you can get it by mingling to people who is infected with virus, droplets from coughs or sneezes, or skin contact and transmitted it inside your body. Currently there is no known cure or medication for MERS-CoV and the treatment only is to keep the virus at bay by boosting the immune system of the patients. Patients who suspected to have MERS-CoV should be quarantine immediately or it will infect his whole family and love one. The best thing to do right now is to buy a dozen pieces of face mask, wash hands frequently and take your vitamins to strengthen our body’s resistance against this virus.